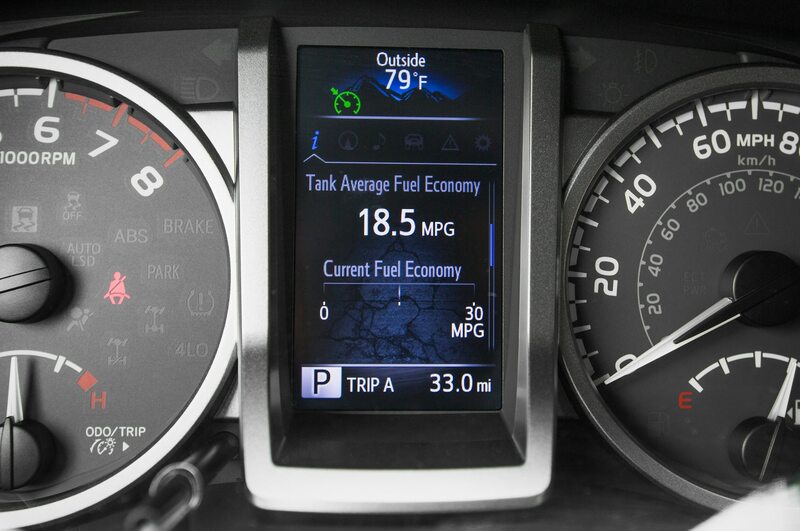 Tidbits about new features and tech on the updated truck. 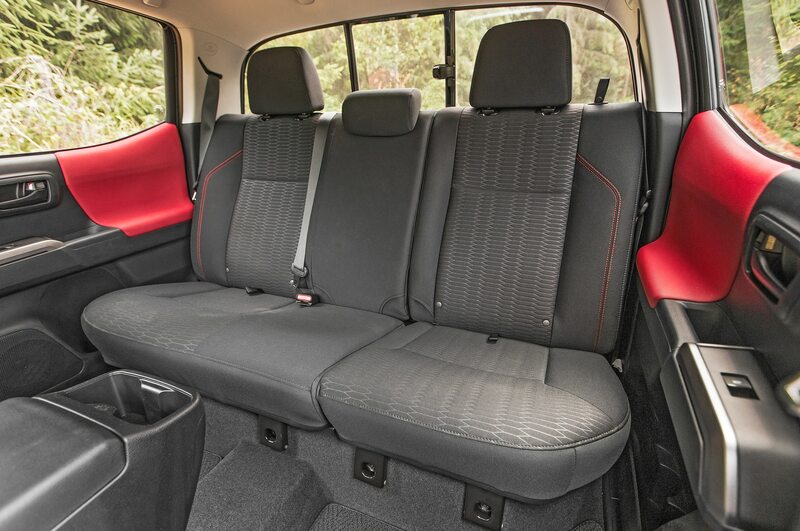 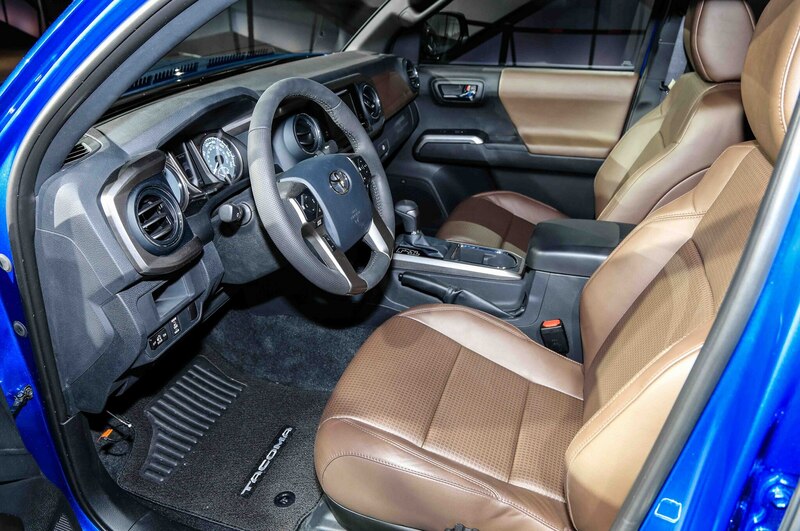 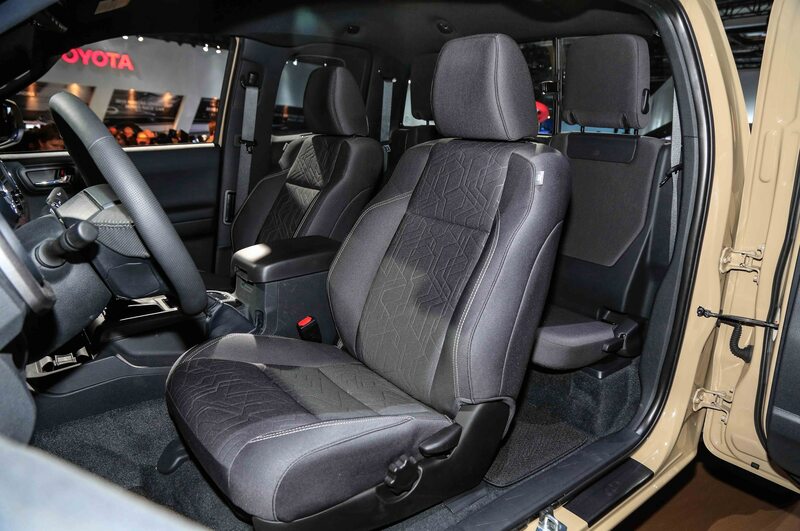 Toyota’s popular midsize truck has a new look, a new V-6 engine, and an updated interior for 2016. 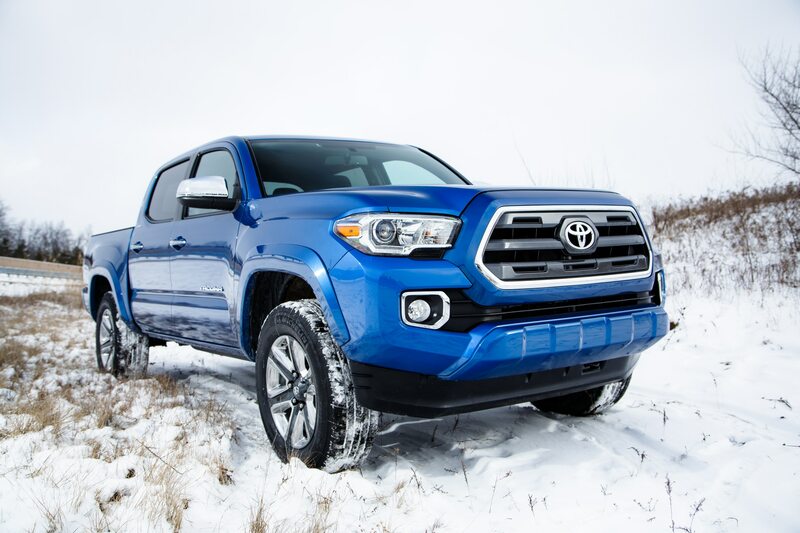 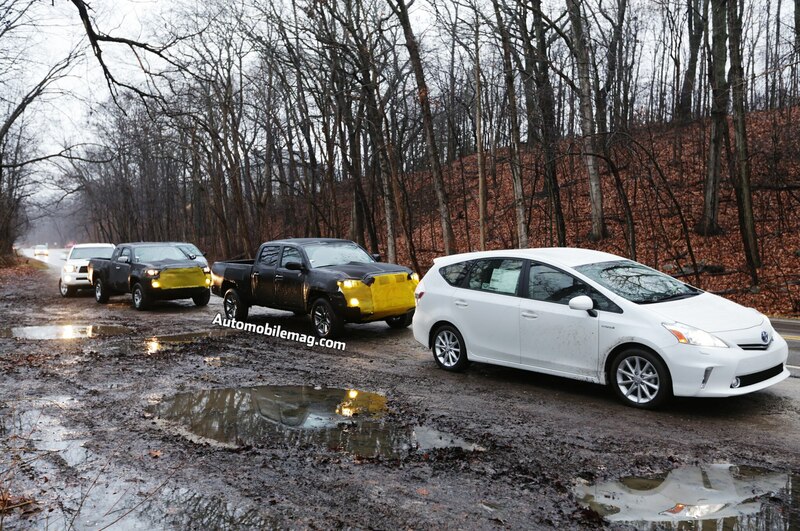 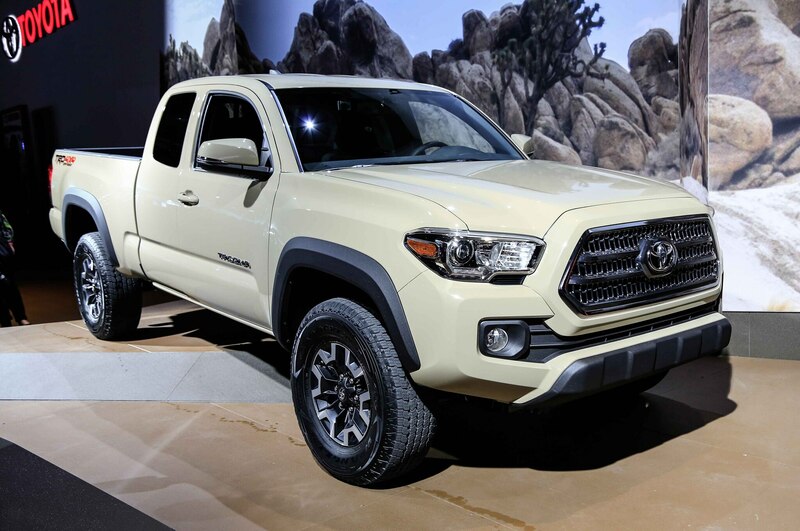 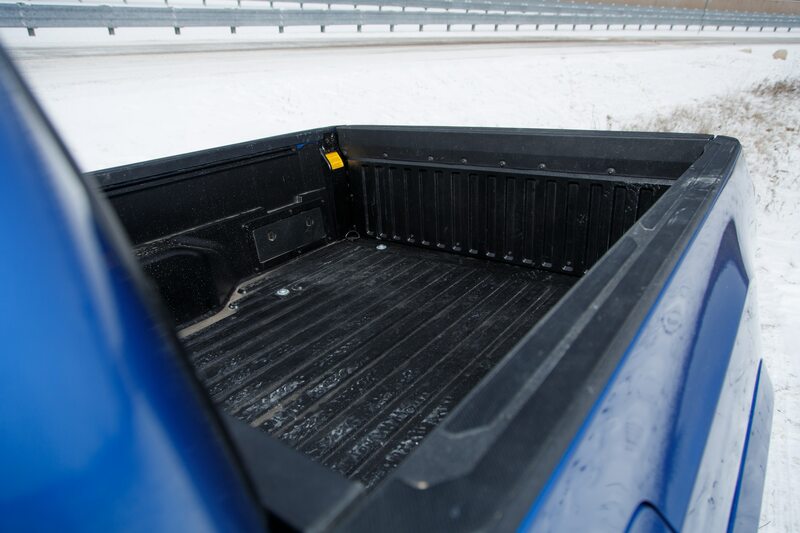 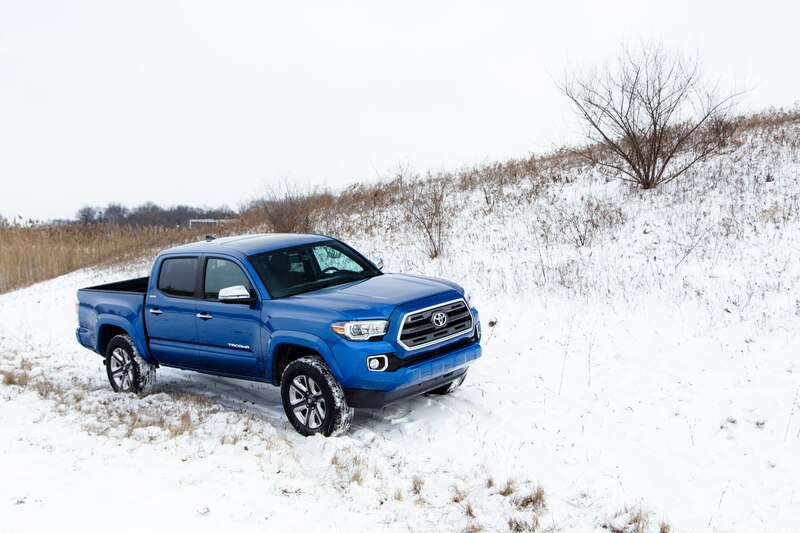 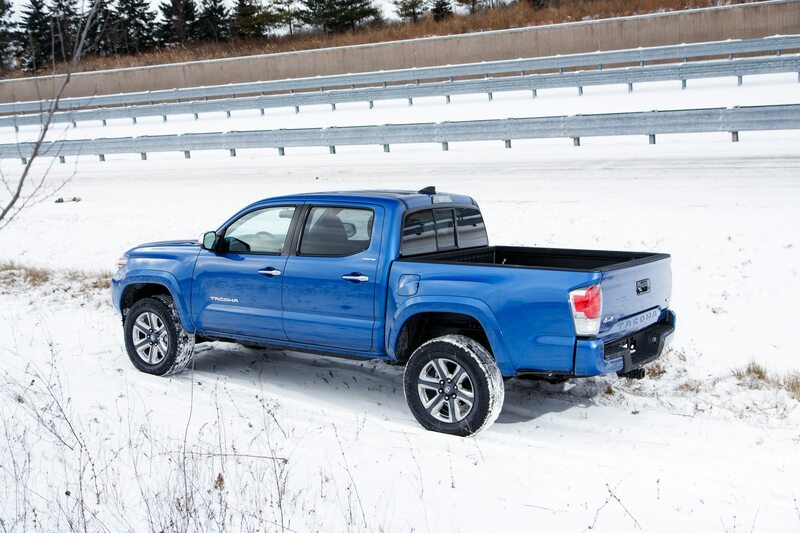 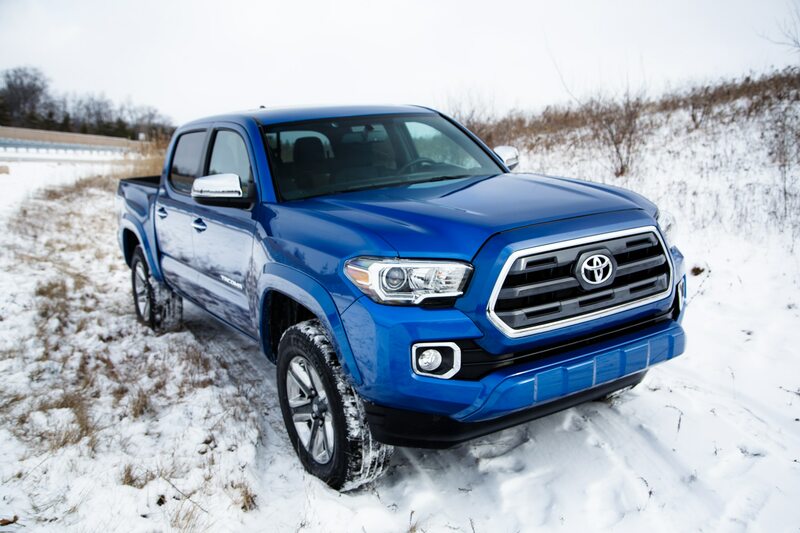 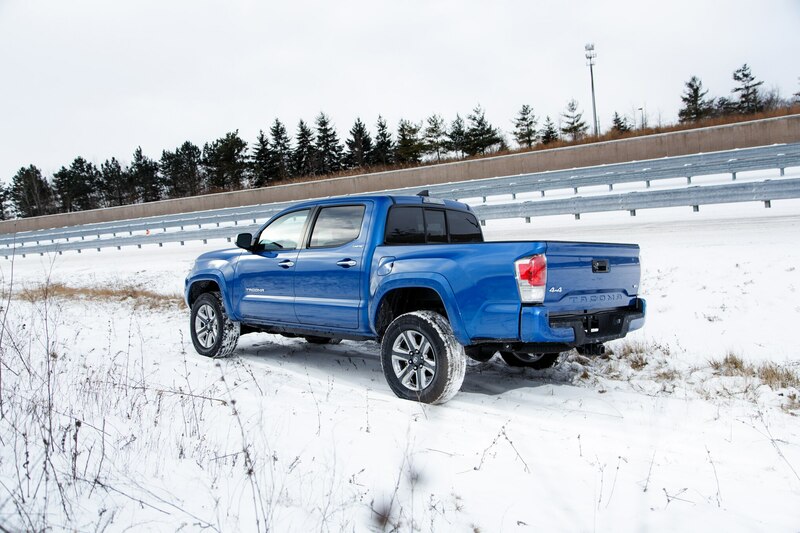 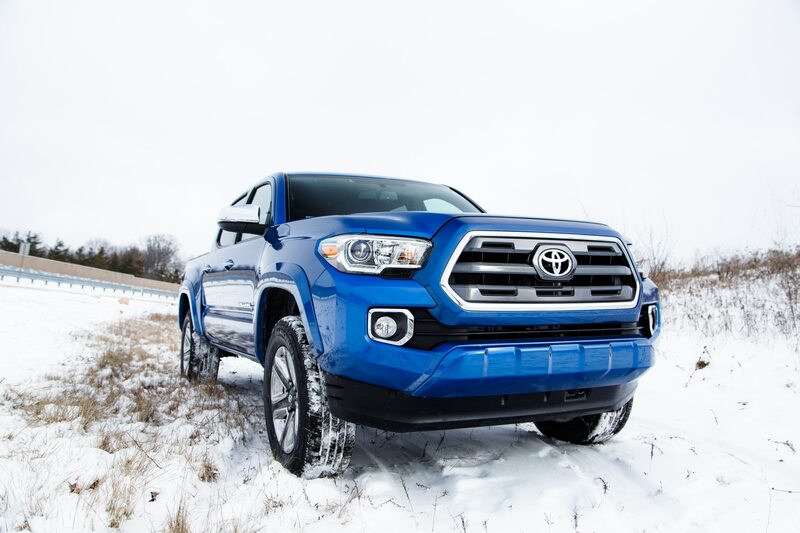 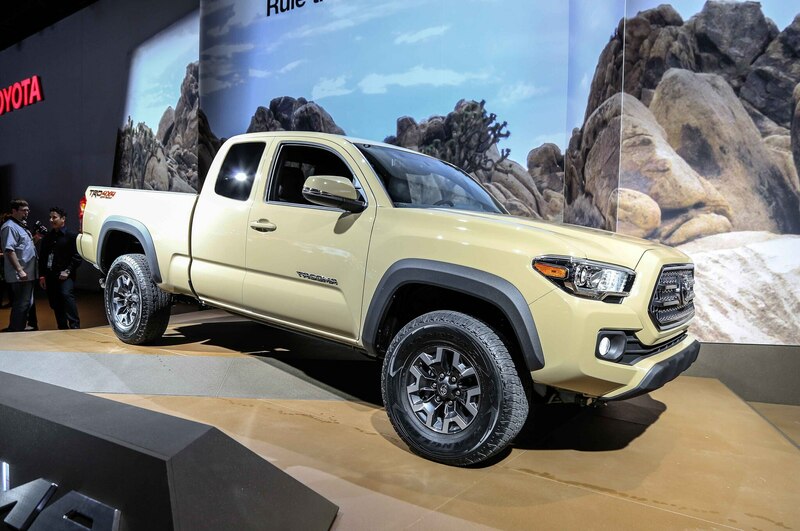 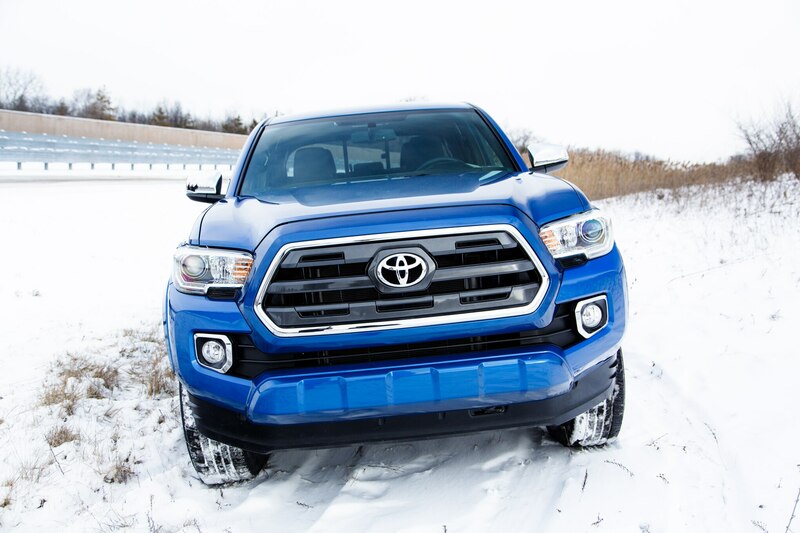 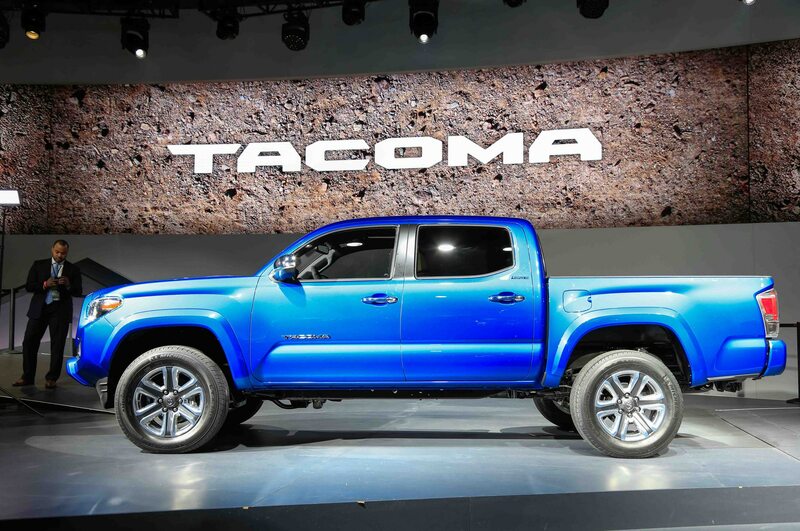 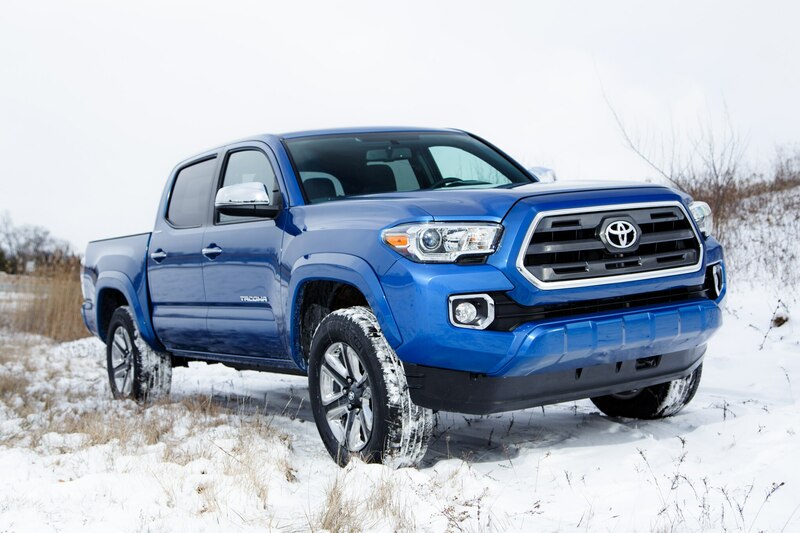 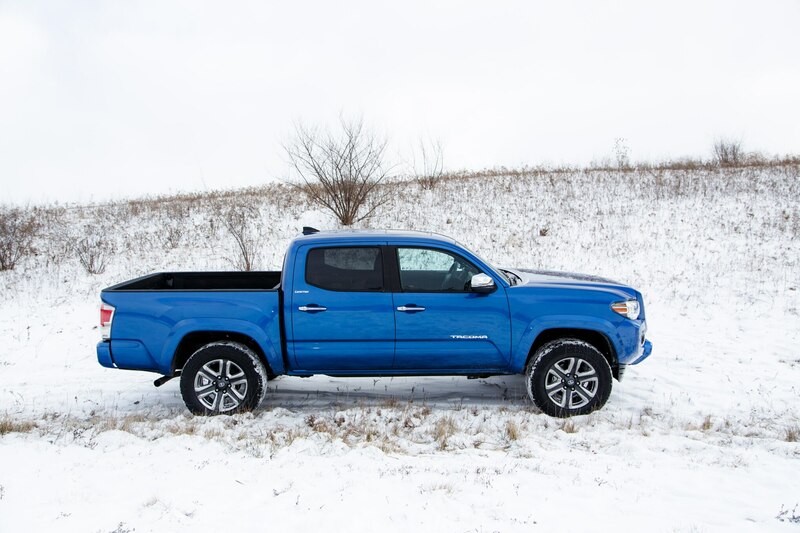 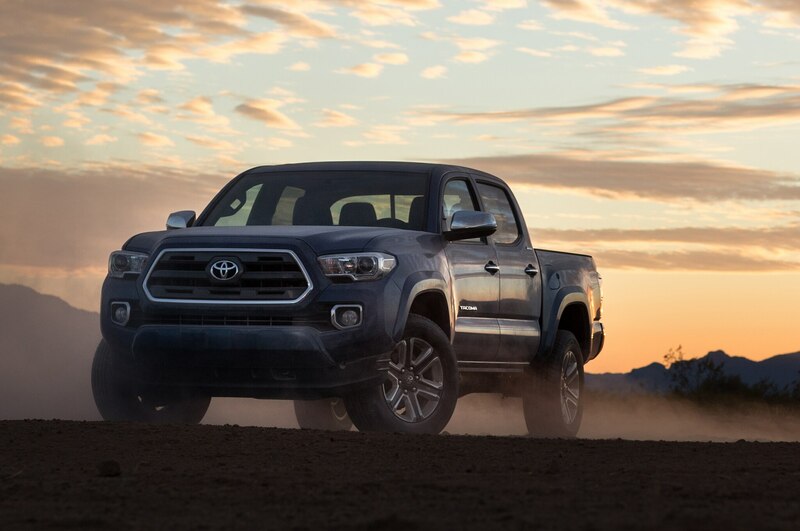 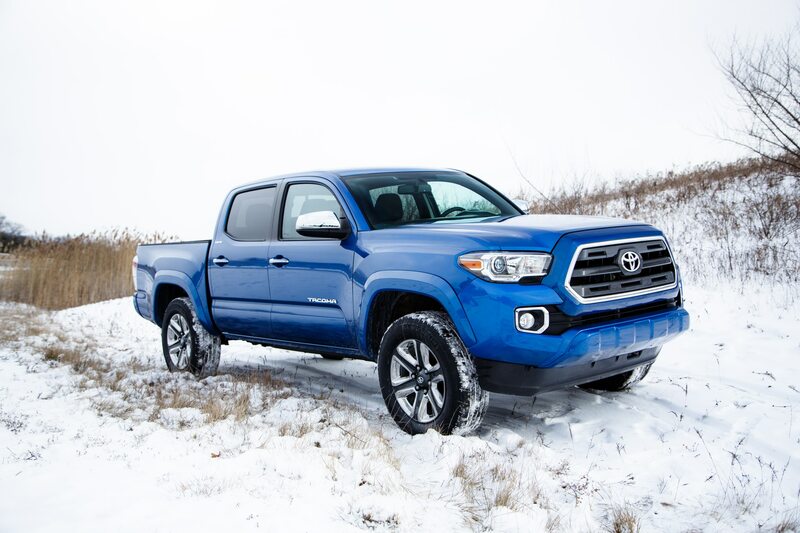 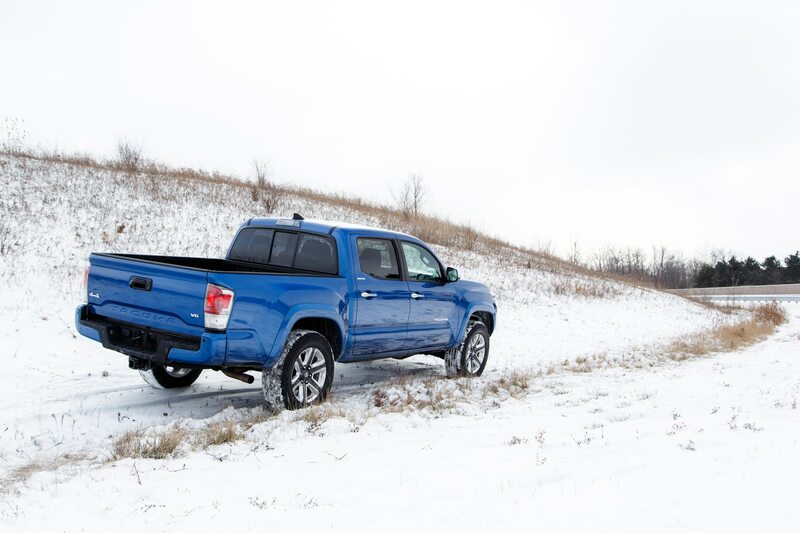 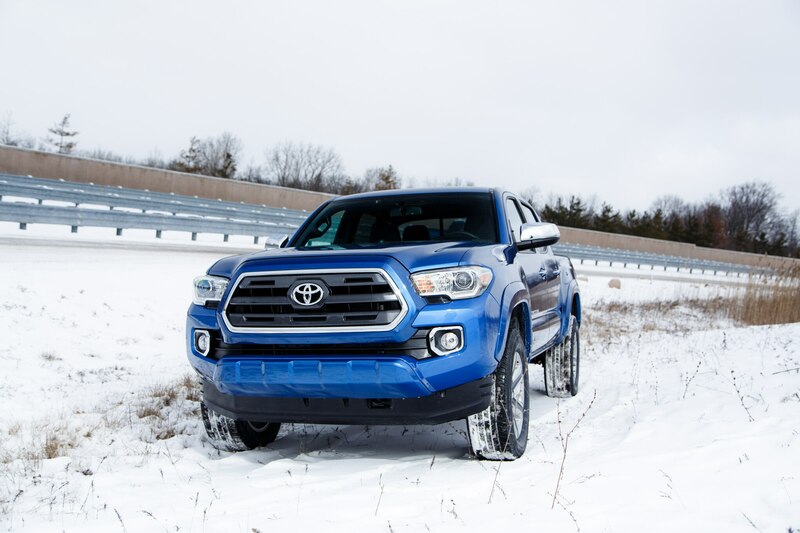 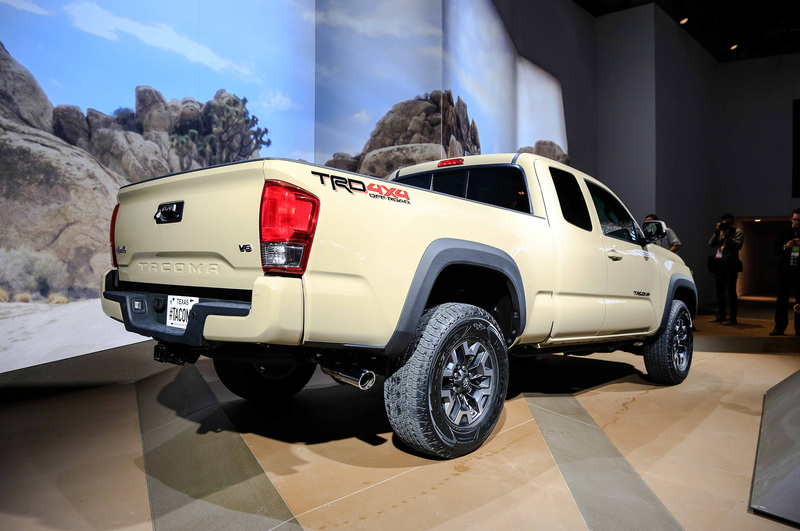 Toyota also added some interesting new equipment and focused on the details in order to set the Tacoma apart from competing trucks like the Chevrolet Colorado and Nissan Frontier. 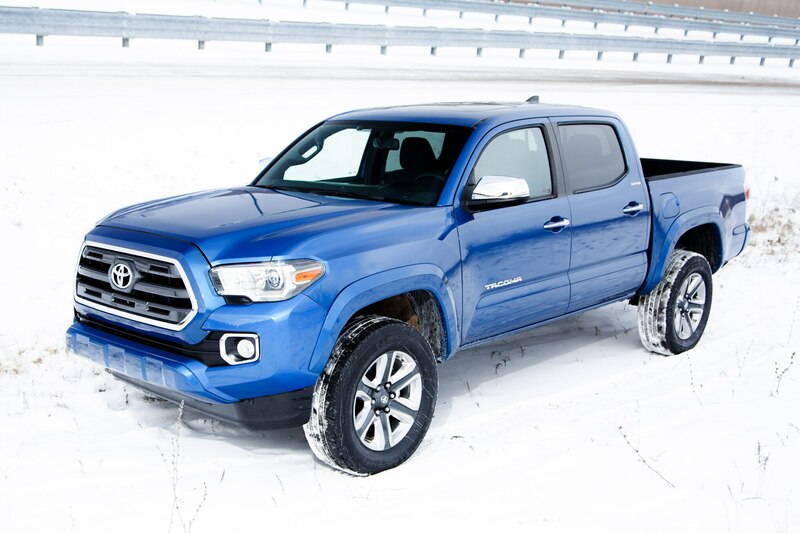 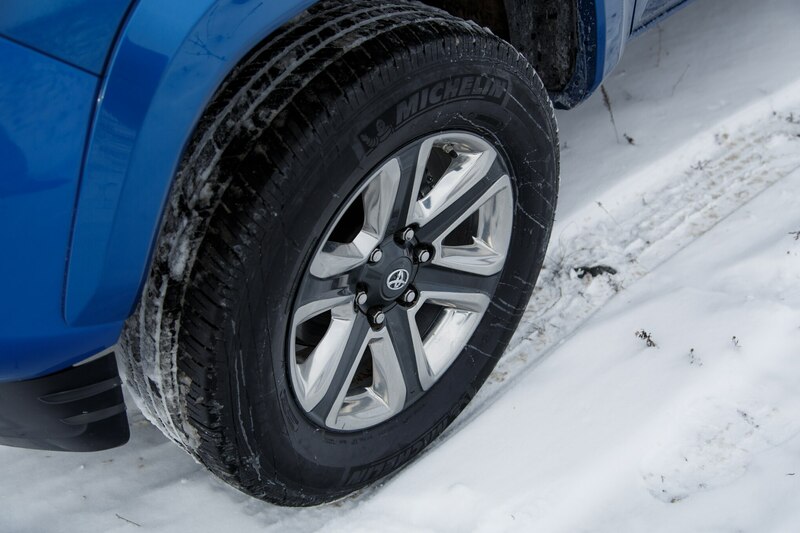 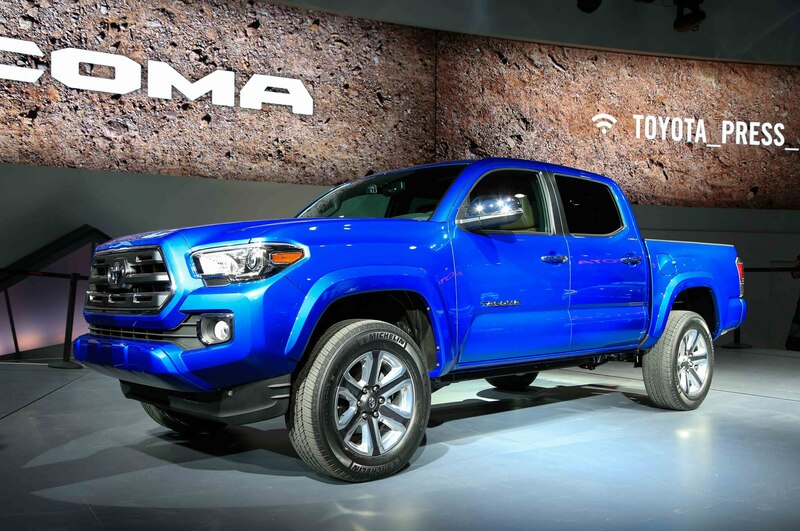 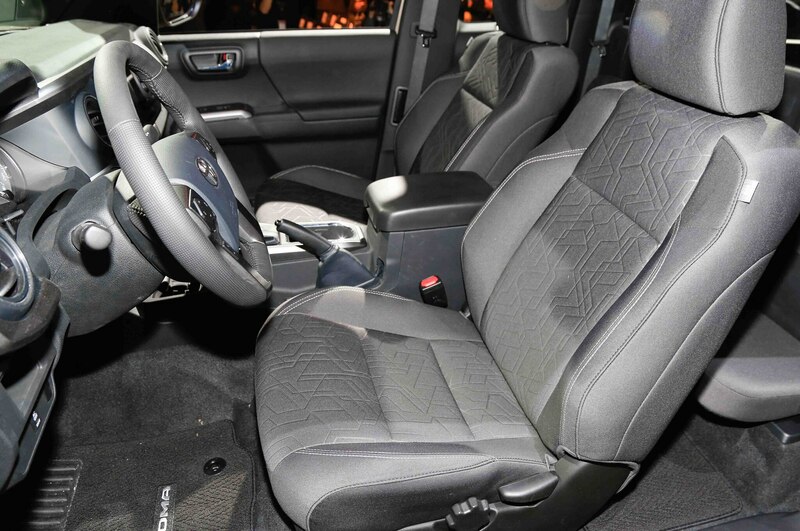 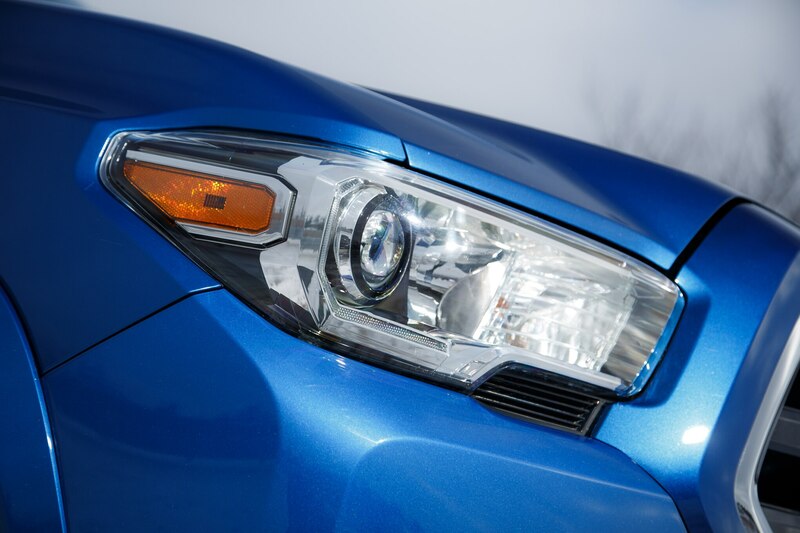 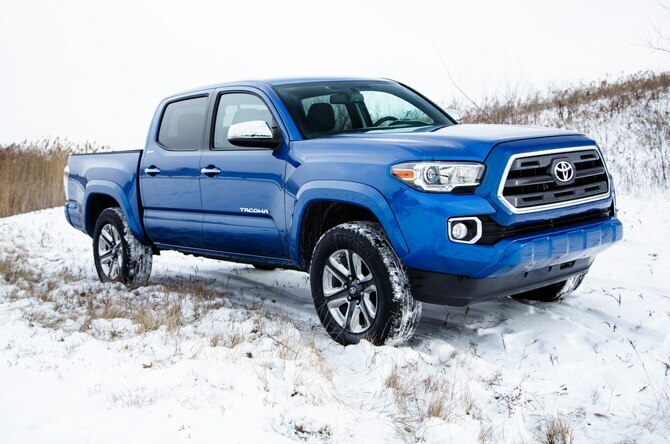 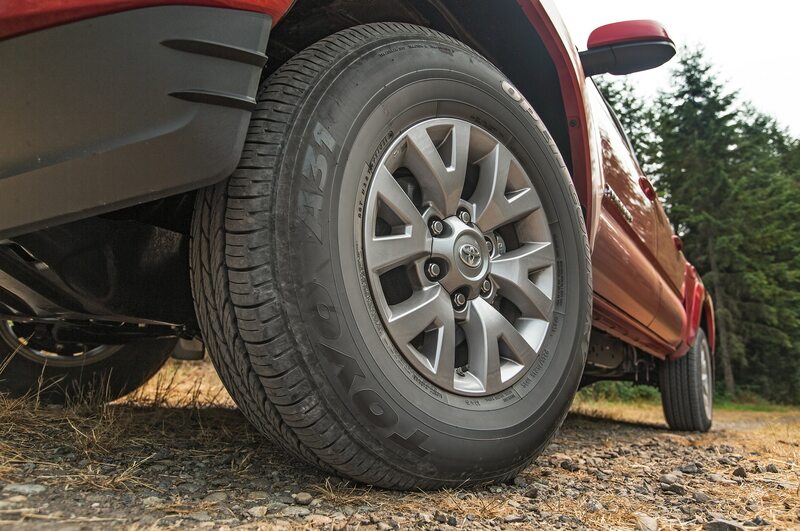 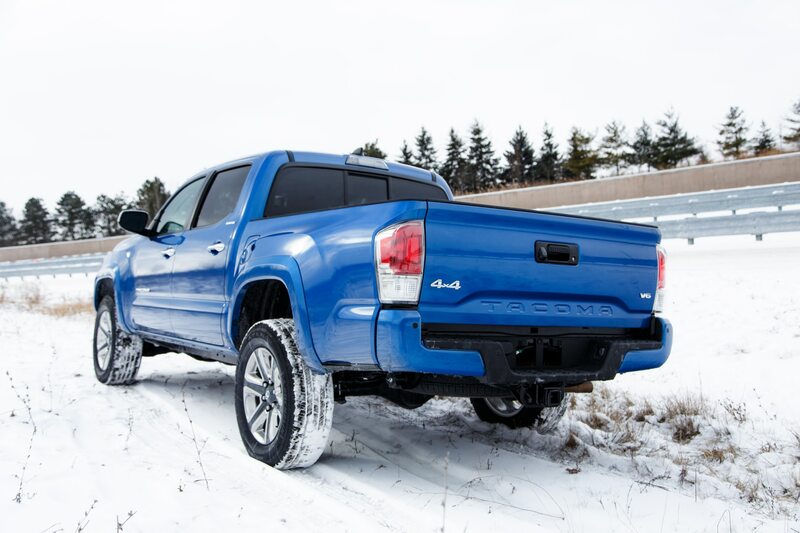 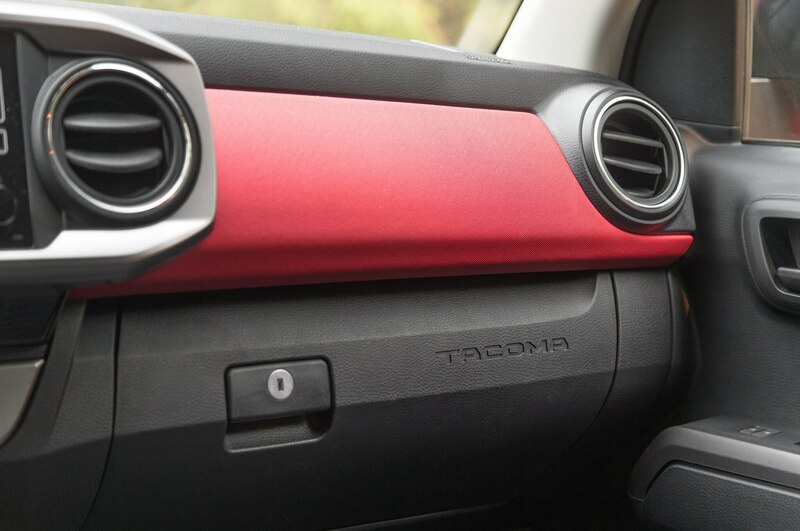 Here are some of the coolest tidbits about the 2016 Toyota Tacoma that are new for this year. 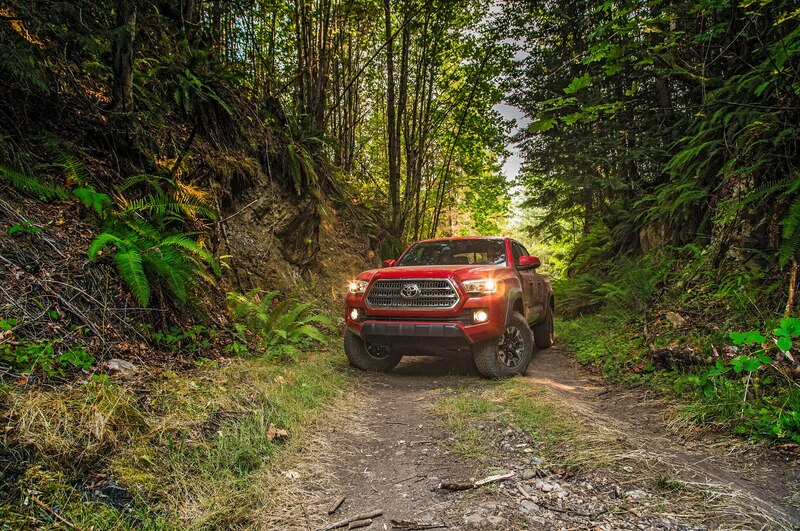 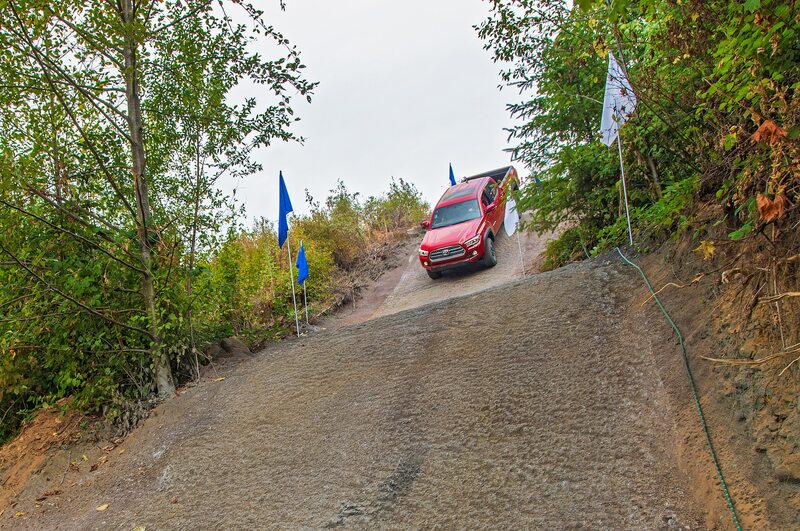 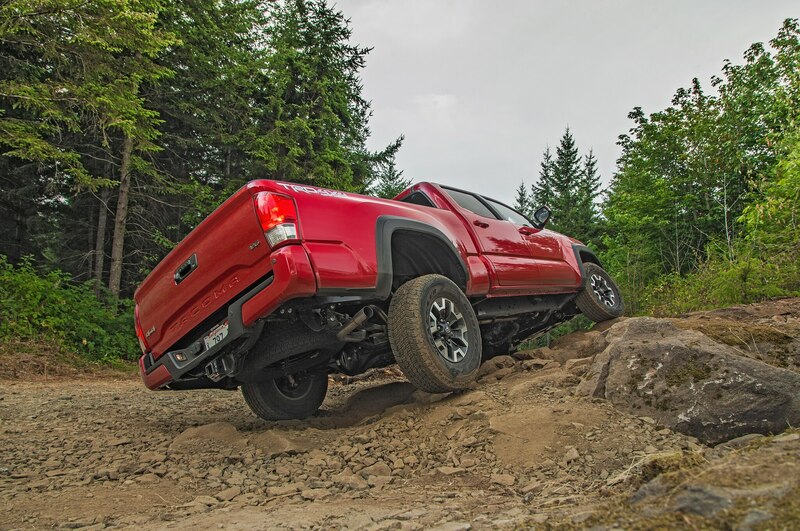 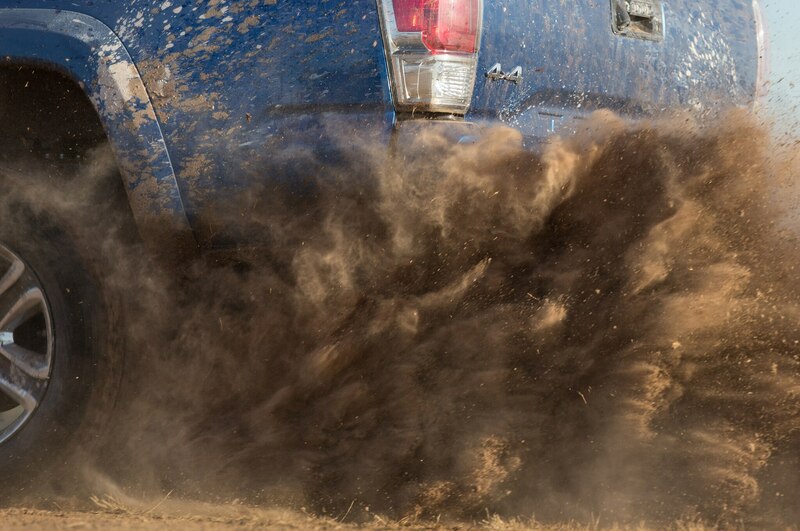 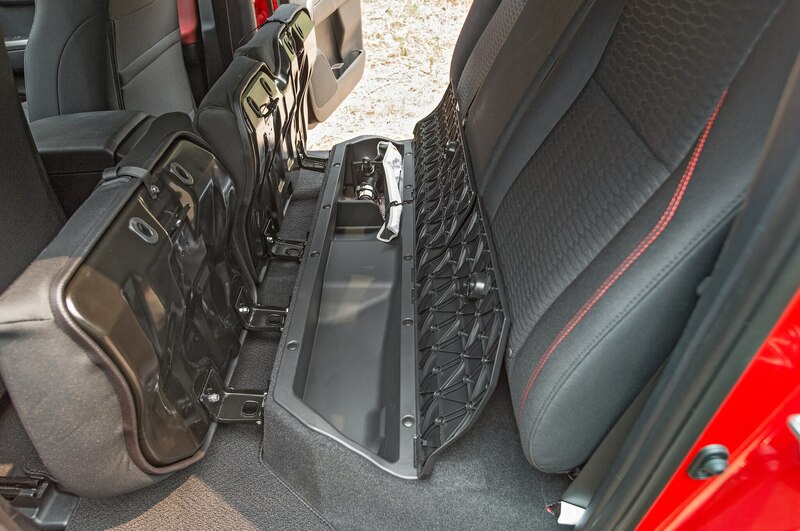 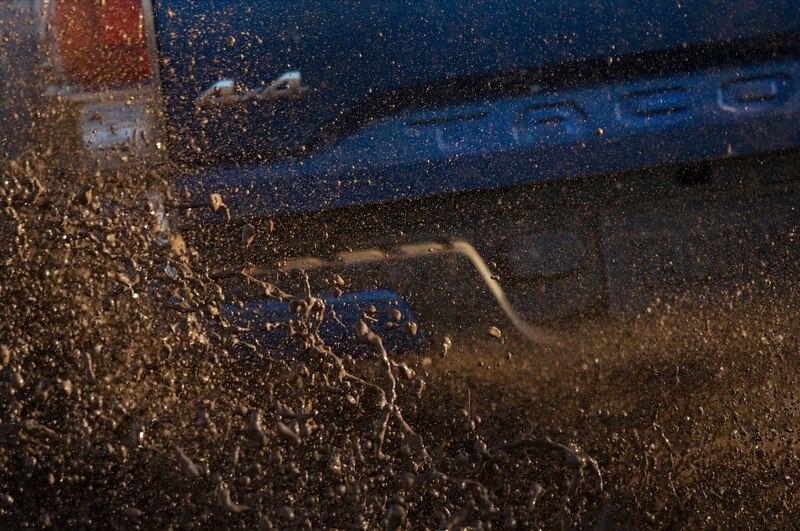 Included on the 2016 Toyota Tacoma TRD Off-Road trim level is a new system meant to optimize this truck for various off-road conditions like mud, sand or loose rocks. 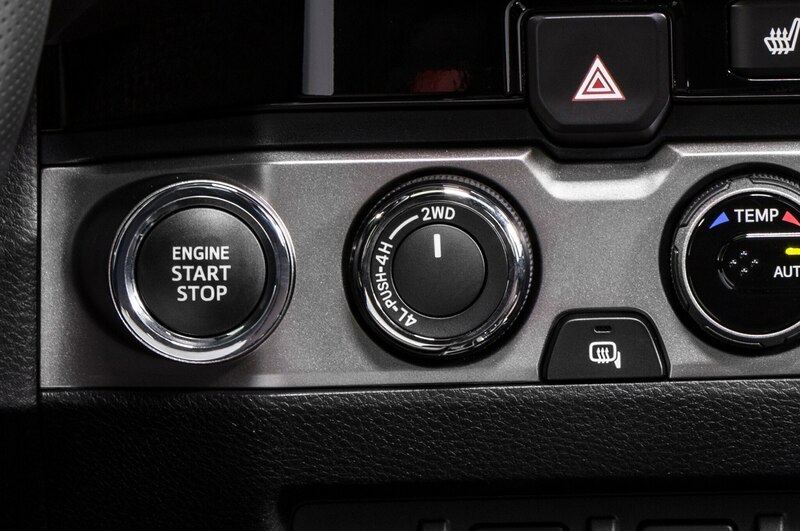 Turning a knob in the cabin changes various settings for throttle and brake sensitivity and helps regulate traction for these different types of surfaces. 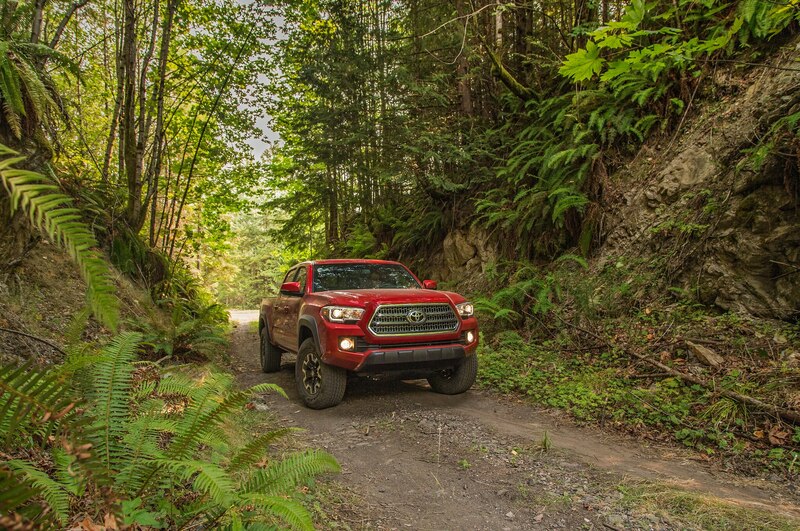 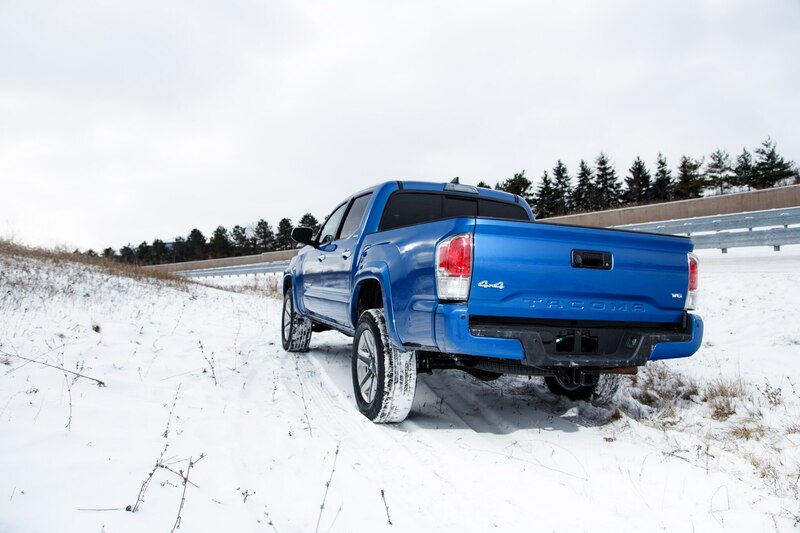 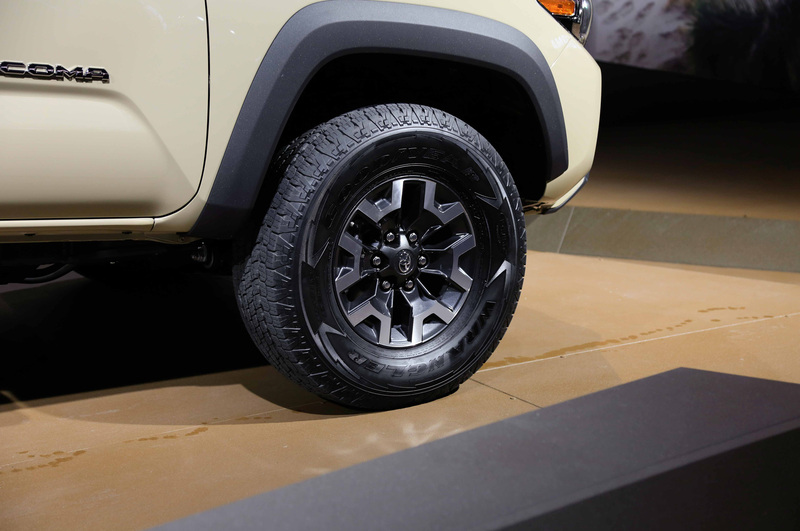 A locking rear differential and a Crawl Control system are also part of the TRD Off-Road package. 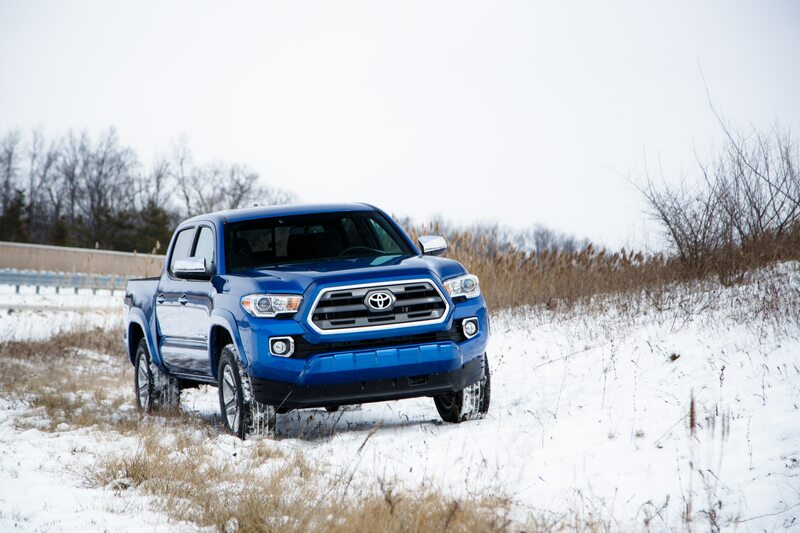 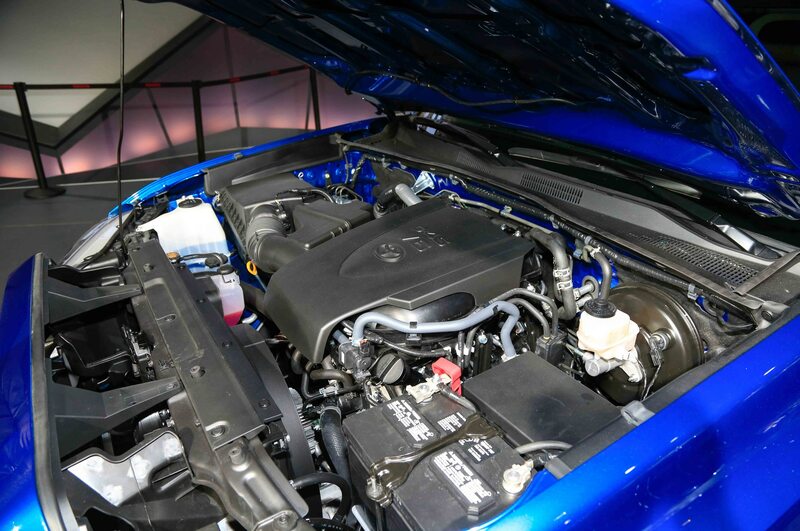 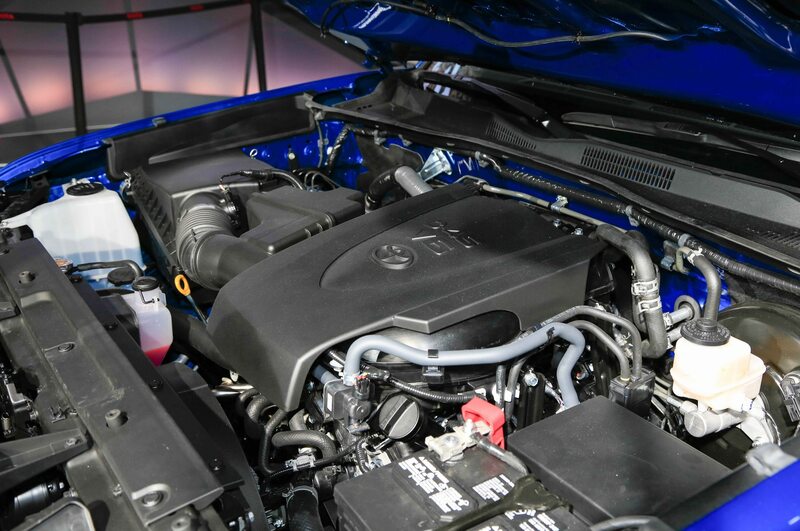 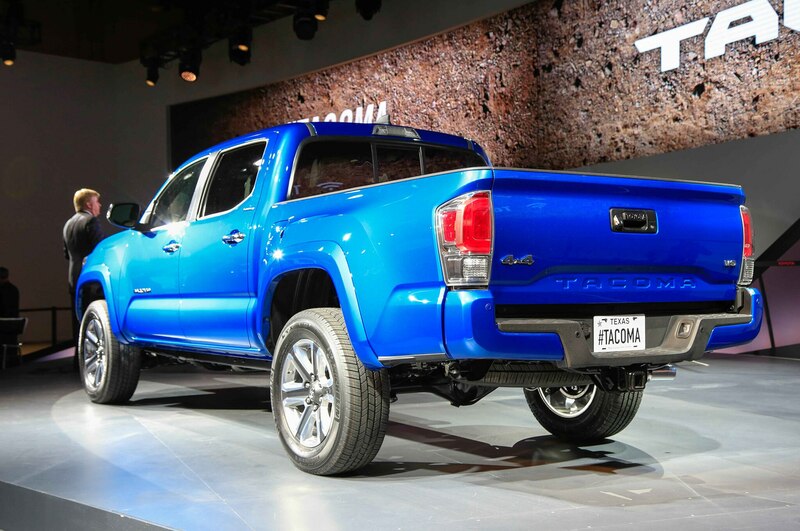 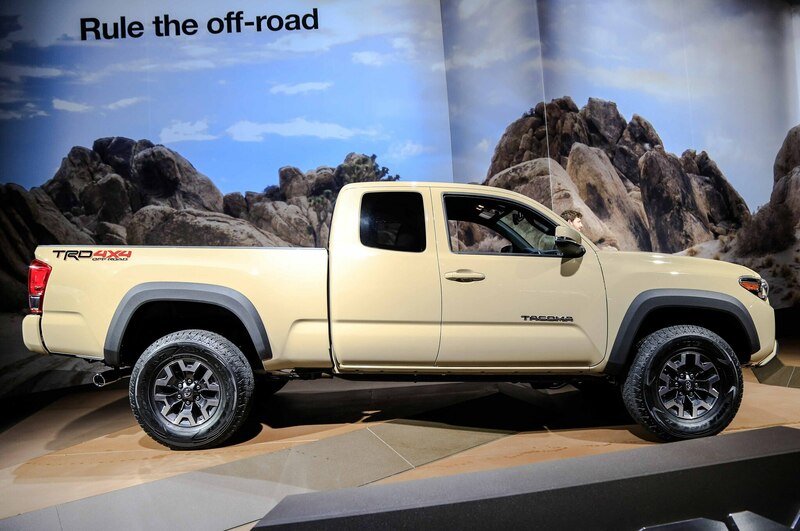 The 2016 Toyota Tacoma is available with both a 2.7-liter four-cylinder and a new 3.5-liter V-6 engine. 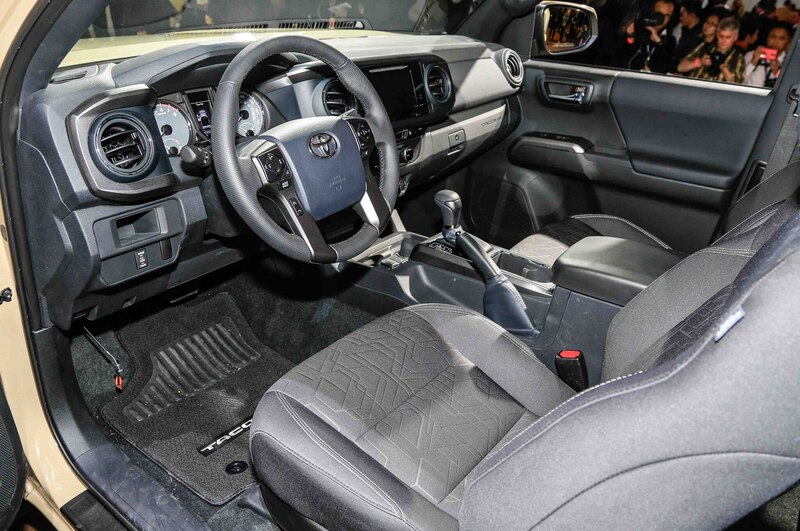 Luckily for stickshift truck buyers, both engines keep their shift-it-yourself options, with the four-cylinder offering a five-speed manual and the V-6 offering a six-speed manual, in addition to both engines’ optional six-speed automatic transmissions. 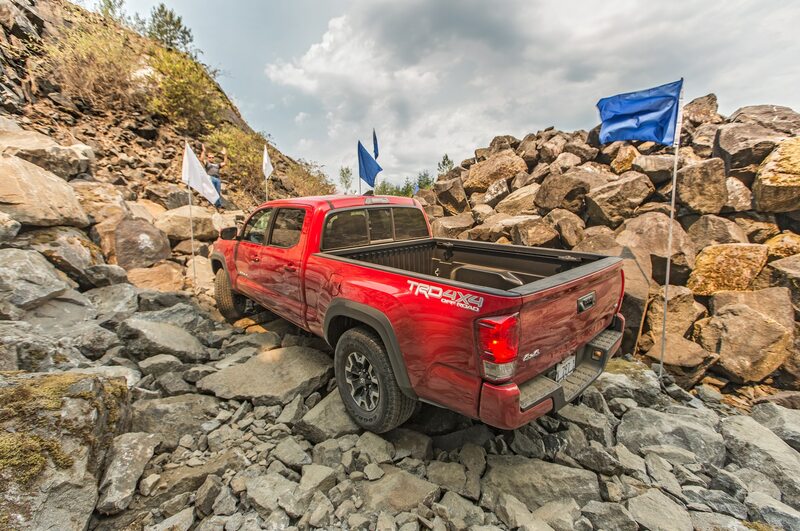 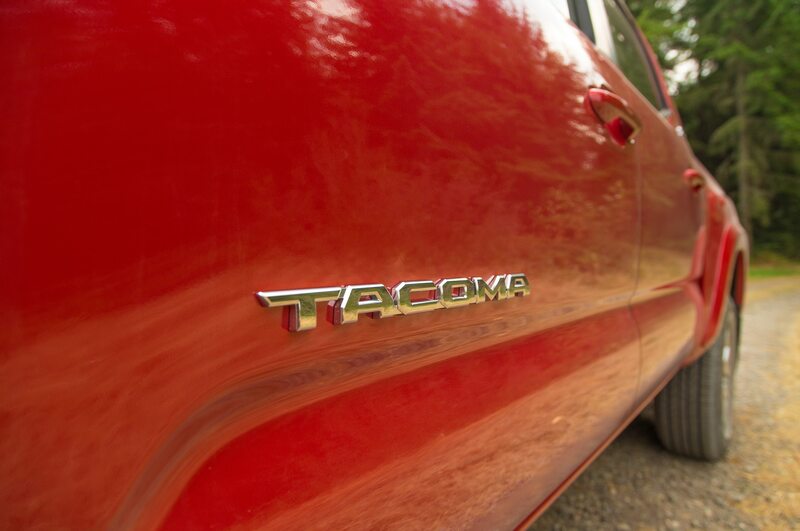 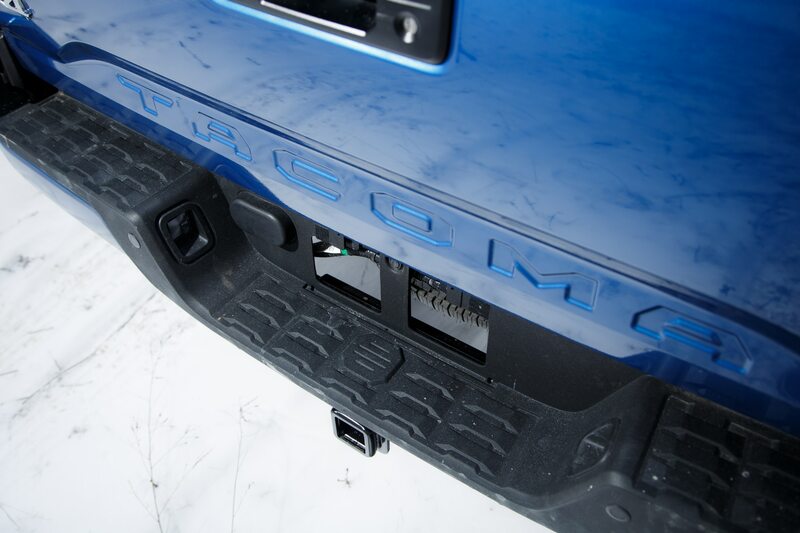 Instead of a normal “Tacoma” badge on the tailgate, the 2016 Toyota Tacoma has its name directly stamped into the sheetmetal. 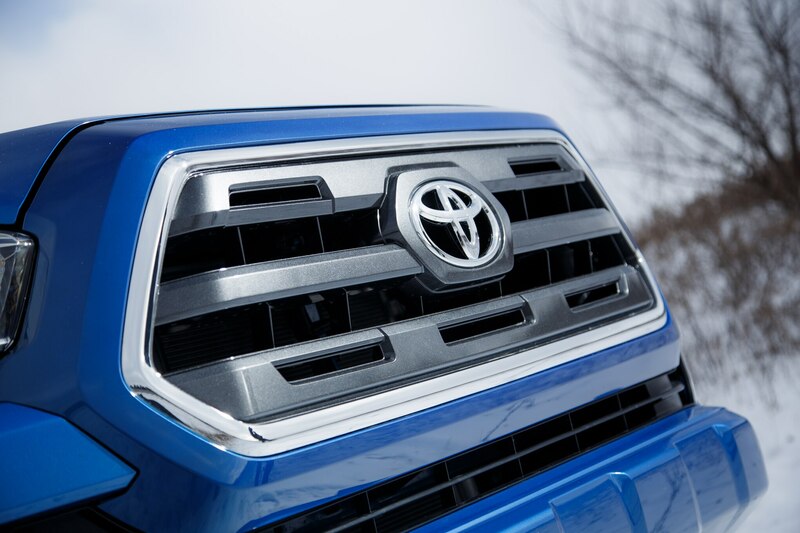 This cool detail was first shown on the Toyota Tundra and helps create a stronger family resemblance between the two Toyota trucks. 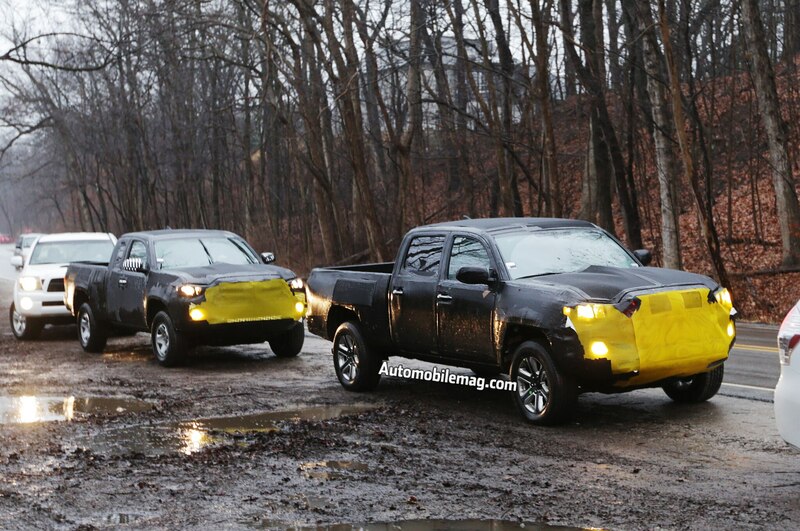 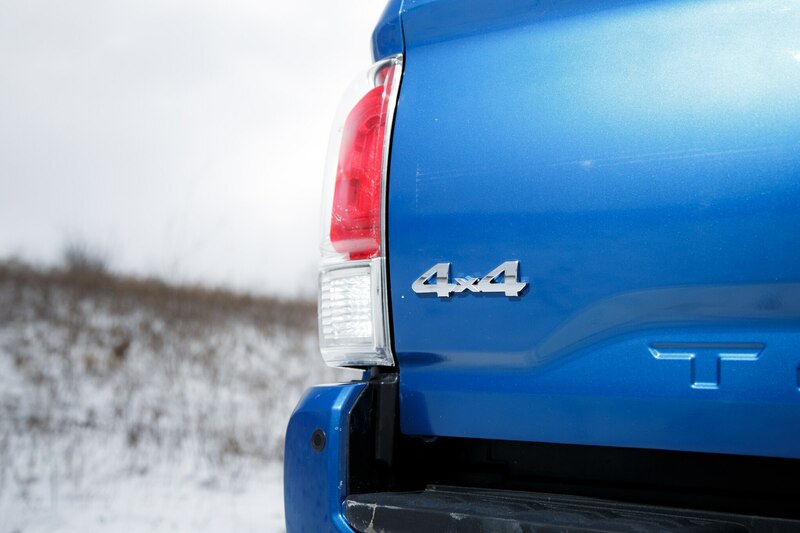 The new Chevrolet Colorado and GMC Canyon have upped the standard for technology in midsize trucks, and Toyota is finally bringing the Tacoma into the modern era by offering blind-spot monitoring and rear cross-traffic alert as a new option. 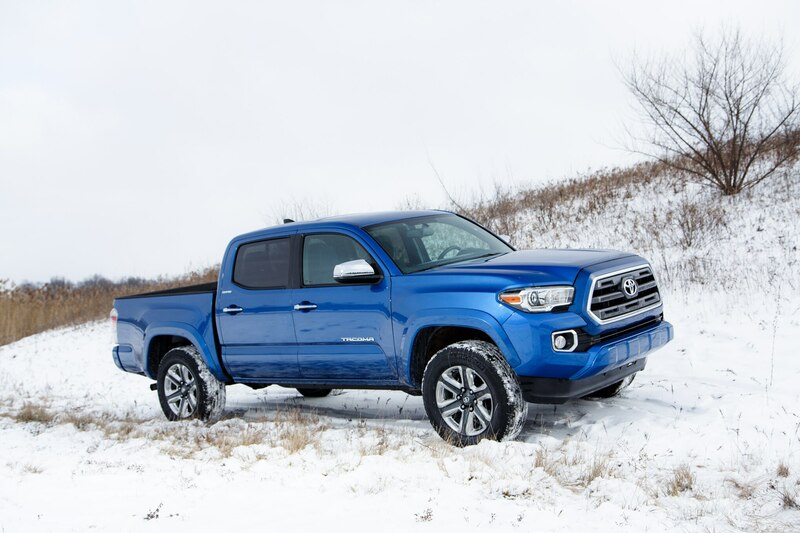 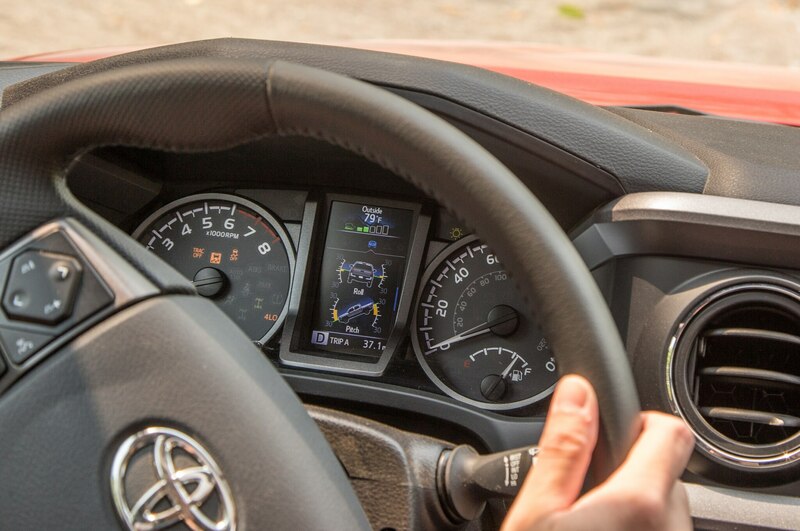 Though it still falls short of the Colorado’s available forward collision warning, the addition of these two new features is at least a step in the right direction for Toyota’s updated truck. 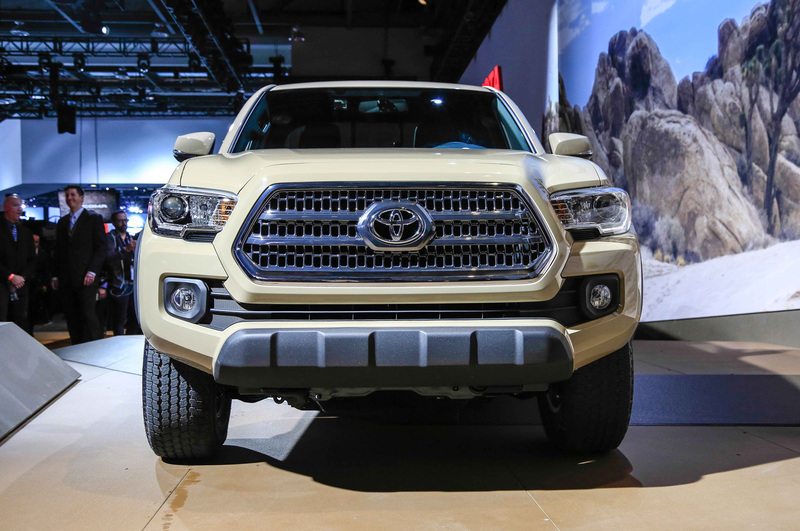 Every 2016 Toyota Tacoma comes standard with a mount near the rearview mirror that’s intended for a GoPro portable camera. 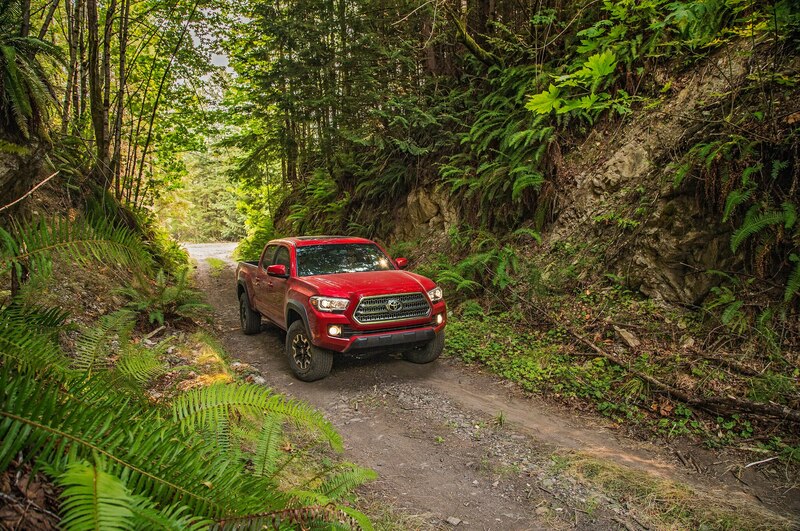 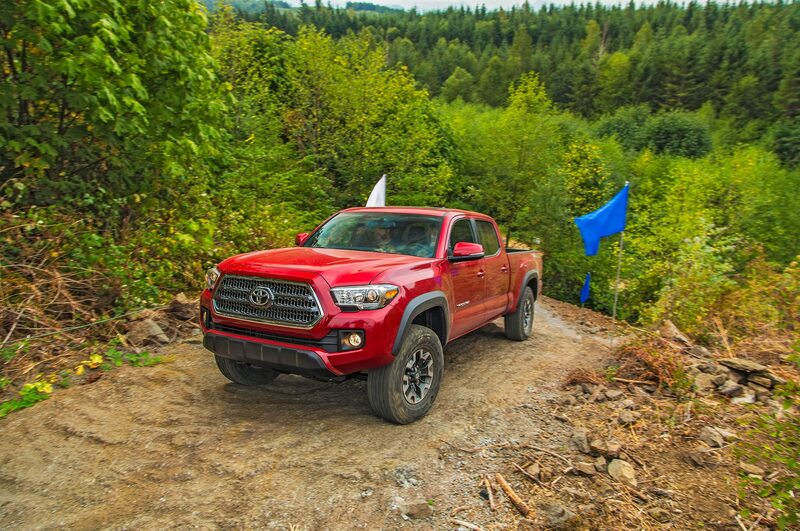 We can imagine off-roaders who opt for the trail-ready TRD Off-Road model getting plenty of use out of this feature as a way to easily record various adventures on video.